As someone that travels a lot, though your thoughts might be engulfed with the missions and purposes behind your travelling. But it is still advisable you maintain a healthy eating habit so as to satisfy your nutritional requirements throughout your journey. In order words, nutrition should also be placed high in your priority list. Knowing what to eat and when to eat while you are embarking on a journey is sometimes the most important thing because it does not only affect how well you will enjoy your trip, but it also have a great impact on your overall health. No matter the city, nation, or country you are travelling to, or how long the trip is going to last, you should always prepare to eat healthy. You should not fall into the snare of fast foods simply because it is convenient. I guess you will love to maintain a healthy eating habit while travelling, right? Let me show you some tips you can easily follow to achieve that. This is practically needed especially when you travel to a foreign country. Take your time to study the residents of this new environment, what kind of food are they eating? What food joints or restaurants have the highest patronage? If you find the answers to those questions, then you should join the bandwagon. It also advisable that you avoid street foods, though the habit of eating street foods is popular with tourists but it is not always a healthy choice. Under-cooked street foods can also be detrimental to your health. Not only does foods have an impact on your overall health, it can also contribute to common travel plight such as jet lag. You should avoid any food that contains caffeine, especially drinks, because they can cause dehydration, and dehydration is a common cause of jet lag. Always remember to keep yourself hydrated by drinking a lot of water throughout your travelling experience. Eating foods that are high in salt or fat can make travelling a little bit difficult. And eating too much of them is a case that calls for alarm. Salt does not only increase the water retained during air travelling, it can also make you feel sluggish and tired. Fatty foods also have the same effect, so i will advise you to stay away from rich fatty dinners and any other snacks that contains huge amount of salt or fat, for example chips. If you are flying for an extended period of time, this water retention can be even more problematic, because swelling often occurs while travelling. This might sound funny, right? But it is sure a better option. It is an extremely good idea to travel along with your own food, it could be an alternative to airplane food. or a healthy snack while you journey. Example of such foods includes; fruits, peanut butter, or a nutritious bar. If you cannot bring your own food, then you should plan your meals earlier. This is easy if you intend to travel by air, ordering in advance is a great way to ensure you have a meal that suits you and your diet. This can be very important if you have food allergies. Even if it means you have to wake up a little but earlier to achieve this, you should always make time for breakfast. Breakfast is the most important meal of the day. If you are in a hurry and you need to eat something quick, you should go for a food rich in fibre, or whole grains just like oat meal or cold cereal. But if you are not in rush, you should go for a balanced breakfast combining carbs with proteins and grains. 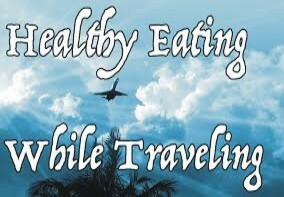 Maintaining a healthy eating habit while travelling should always be placed on top priority by individuals that are travelling. Learn this and stick to it. Feel free to share this information.